Demodex originates from the Greek –demos meaning fat and dex meaning worm. It has an affinity for hair follicles and especially sebaceous glands including those on the eyelid margins-these are the meibomian glands and are extremely important in our normal pre corneal tear film. Demodex infestation is one of the primary causes of blepharitis-a chronic inflammation of the eyelid margin. Symptoms include itching, eyelid redness, itchy lids and a visible crusting at the base of the lashes. These creatures release toxins ,basically faeces, which triggers inflammation. vision can also be affected by the effects on the tear film. almost 50% of patients with blepharitis have Demodex with the prevalence increasing as people get older-in fact 100% of those aged 70 and older are estimated to carry a colony of 1000-2000 mites!! Older remedies such as baby shampoo are totally ineffective on Demodex and in fact may further aggravate the lid margins. We advise examination of your lid margins for the signs and symptoms. Treatment is then instigated with thorough lid cleaning with micro dermal abrasion and use of specific cleaners containing dilute tea tree oil. The active ingredient in tea tree oil is terpinon-4-ol but this must be in diluted form as in its pure form is extremely harsh on the skin and can cause severe ocular irritation. We will advise you on the use of Blephadex or Sterilid which can be effective. 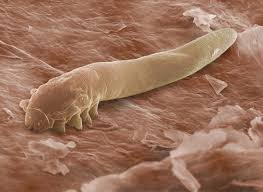 So although it might be a bit scary to learn you have mites on your lashes- we can advise manage and cure.